Clarity of vision, focusing ability, eye movement, eye teaming and perception, or the brain’s interpretation of visual information, all play fundamental roles in clear and comfortable vision. When they work in unison, vision is clear and comfortable. But for those who have an issue with one or more of these systems, vision can be uncomfortable, reading can be difficult and classroom and athletic skills can suffer. Fortunately, Kara Collier, OD, at Artisan Eye in Lakewood Ranch, Florida offers vision therapy as an option capable of improving a number of these vision and eye conditions. To learn more, request an appointment online or over the phone today. Vision therapy is an effective, nonsurgical treatment for numerous vision problems. The therapy consists of a combination of in-office and at-home activities individually prescribed and monitored by the doctor to develop efficient visual skills and processing. During vision therapy, proven techniques and activities are used to strengthen the control of eye movements, improve how the eyes work together, and the ability to gather and process visual information. If you have trouble reading, this might also be an indicator that you need vision therapy. If you notice that you often skip words or lines unintentionally or regularly lose your place, this could signal that you’re eyes aren’t working together properly. Other indicators include having frequent headaches and trouble focusing. If you experience any of these problems, contact Artisan Eye to see if vision therapy can help you. What can I expect during vision therapy? 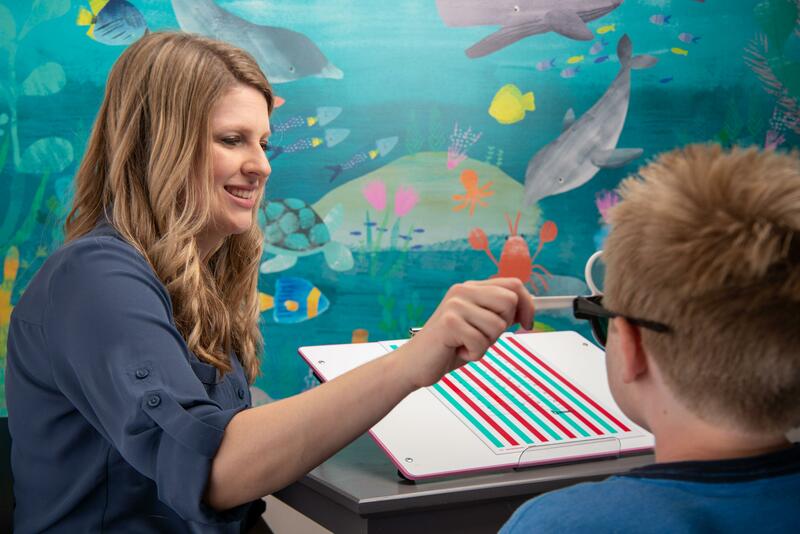 Vision therapy is a structured program of activities individually selected by Kara Collier, OD, to meet the needs of each patient. Each session is supervised by Dr. Kara Collier, allowing her to tailor each step to align with your goals and progress. You will also have exercises to perform at home between sessions for continued reinforcement. At Artisan Eye, vision therapy usually involves using different lenses, prisms, filters, patches, and specialized equipment in tandem with balance, movement, cognition and listening tasks. During vision therapy, you’ll be engaged in activities that help your eyes get better at focusing, teaming, tracking, and processing information. If you’d like to learn more about vision therapy, request an appointment online or over the phone with Artisan Eye today.